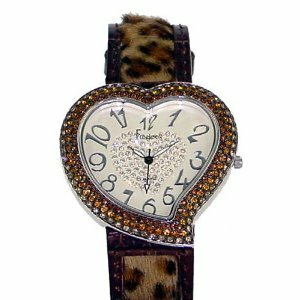 The Freelook Women’s Heart Shape Brown Leather Band Watch combines luxurious style with whimsical detail. It features a stylish brown leather and Leopard spotted band with secure buckle clasp. The brass heart-shaped case is accented with a Swarovski crystal and brass bezel that adds extra eye-catching sparkle to an uncommon and noteworthy timepiece. The analog display features a unique white dial with curvy Arabic numerals adding a touch of fun and flair to mark each hour position. This Freelook timepiece features precise Japanese quartz movement.